Constipation is a common part of pregnancy, but it can be improved. Follow these tips to reduce pregnancy constipation. Most of the pregnant women who have taken my healthy pregnancy classes have had constipation during pregnancy at some point- it is a very common 3rd trimester symptom. It is a horrible feeling, that sensation of pressure – even pain – that will not go away. Once it starts, there is very little (natural) to do other than to go camp out on the toilet with lots of warm water, a stool for your feet, and your mobile device, because you know you will be there a long time. Yes, there are stool softeners and such, but they don’t really solve the problem permanently. Additionally, laxatives should only be used under the supervision of your doctor or midwife because they can cause dehydration and uterine contractions. Many of my students who had constipation during pregnancy did not realize that the actions below were contributing to their problem. They did not realize that these were mistakes. Fortunately, relieving constipation naturally is fairly simple. 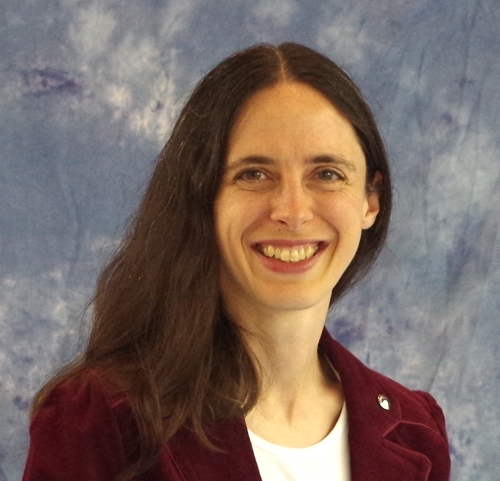 Once my students were aware of the connection between the actions listed below and their constipation, those who made some changes – often just a few changes, not everything on this list – found that their symptoms improved. 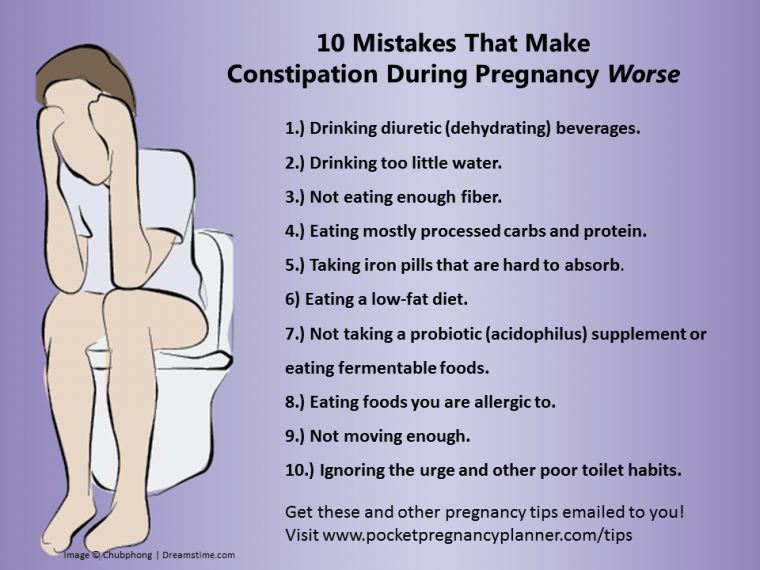 There are 10 common mistakes that most of us make at some point that increase the chance of developing constipation during pregnancy, or will make it worse. Here they are so you can start avoiding them. 1.) Drinking diuretic (dehydrating) beverages. Did you know that beverages like coffee, caffeinated tea, and sodas can encourage your body to get rid of more water than is in the drinks? This contributes to constipation by not leaving as much water available in the body, so your body then pulls additional water out of the intestines. The exception to this is that there is some evidence that drinking a caffeine-containing beverage in the morning may help the bowels get moving. 2.) Drinking too little water. If your body does not have enough water, it will pull more out of anywhere it can, including recycling water from your intestines. This can contribute to constipation during pregnancy. The general recommendation for enough water for good health is to drink half your body weight in ounces each day. In other words, if you weight 140 pounds, a good goal is to drink 70 ounces of water, juices, or non-caffeinated teas and other beverages a day (milk does not count – it is a food). You need more if it is hot or if you are exercising. 3.) Not eating enough fiber. With our modern, processed food diet, it is very easy to eat almost no fiber during the day. Some of my students diet trackers have shown totals of less than 15 grams of fiber daily. Naturally, those students often complained of constipation during their pregnancies. Fiber helps the waste move through your digestive system smoothly instead of getting stuck, so we definitely want to have enough. By the way – it seems that the US RDA for fiber is too low for many people. That number was chosen based on what it takes to start seeing a lower risk of colon problems, NOT what is needed for optimal health. It is hard to eat too much fiber as long as you are eating it in real foods and not as fiber pills. 4.) Eating mostly processed carbs and protein. We as Americans are especially guilty of filling our plates with a big pile of rice or potatoes and meat. If we have any vegetables, it might be a salad served in a tiny dessert-sized bowl, or a couple of spears of steamed broccoli. We NEED to have fruits and vegetables, however, especially during pregnancy. Not only are most of the nutrients, vitamins and minerals going to be more plentiful in fruits and vegetables, but the higher water content and fiber content of produce helps prevent constipation. And yes, prunes have actually been proven to help constipation. 5.) Taking iron pills that are hard to absorb. We have an increased need for iron during pregnancy. Many, if not most, pregnant women are told to take an iron supplement during pregnancy to increase their iron levels because they are not eating enough iron. The problem is that most prescription iron supplements are not easily absorbed, so they can cause constipation. Try to avoid iron supplements that use ferrous sulfate, and look for ferrous gluconate or ferrous citrate, or a chelated form of iron, instead. A couple of good options are blackstrap molasses and Floradix (affiliate links). 6) Eating a low-fat diet. It’s true – low fat is not all that it is cracked up to be. Our bodies need fat, it just needs to be good fat. Those good fats are used for all kinds of things, including helping the digestive system function properly. Good fats include olive oil, nuts and seeds (especially raw nuts and seeds), fatty fish (limit amounts of fish to limit mercury), avocado, and ghee. 7.) Not taking a probiotic (acidophilus) supplement or eating fermentable foods. We have billions of bacteria living inside our intestines. In fact, at least half of what we flush away is actually bacteria. So it just makes sense that taking probiotic supplements and eating the foods that the good bacteria live on would help things move along better and prevent constipation during pregnancy. Research shows that multiple strains are more effective at creating the proper balance, so look for a yogurt, fermented food or supplement that contains at least 8 different types, or as many strains as possible. I have seen some supplements with over 30 different probiotic strains. If you already have some GI upset (burping, gas), you may have better success with one of the soil-based “spore” probiotics. 8.) Eating foods you are allergic to. Food allergies can manifest in a wide variety of ways, not just the sudden inability to breathe that we all associate with peanut allergies. One common symptom of food allergies is either diarrhea or constipation. If you have tried everything else and still have constipation, either go get tested for delayed type food allergies, or track your food and mood/symptoms (use this printable diet tracker) and see if you can determine any possible food allergies. Our bodies are made to move, and exercising actually helps move the waste through the GI tract and out of the body. Even just a short walk can help get things moving (pun intended). After a meal is an ideal time for an easy walk. 10.) Ignoring the urge and other poor toilet habits. No, I don’t mean bad aim, or whether your toilet paper goes under or over the roll. The intestinal contractions to eliminate waste are strongest when you initially feel them. The strength will decrease over time, which may make it more difficult to eliminate completely. Also, the longer that waste stays in the intestines, the more water the body will tend to pull out of it, especially if you are not drinking enough. The result? It gets harder and more compacted over time. finally, the way most of us sit on the toilet is not the ideal body position for elimination – our bodies are made to squat. Putting your feet up on a low stool can help significantly. The Squatty Potty and easyGopro – Go Time Just Got Easier Ergonomic Toilet Stool 7.5″ White and similar stools fit around the toilet and save space. If you don’t yet have constipation during your pregnancy, you can reduce the risk of getting it by choosing to replace a few of the mistakes above with better habits. If you are already having trouble with constipation, start at the top of the list and decide which mistakes you may be making. Choose your top 2 items, and come up with a plan to change them this week. If you don’t feel that you are seeing enough improvement in 7 days, choose 2 more habits to change. Which mistake is the biggest challenge for you? Let me know, and we can help each other out! There are affiliate links for the products mentioned in this article. Learn more here. Like this? Follow me for more. Please send “How to Relieve 7 Common Pregnancy Symptoms Easily & Naturally” and email helpful pregnancy tips about once a week. Mayo Clinic Guide to a Healthy Pregnancy. Mayo Foundation for Medical Education and Research, 2001. p. 390.